We are excited to announce Legacy’s Open House season! This is an essential opportunity to see your child’s learning accomplishments first hand. Save the date for your classroom’s Open House and invite your friends! Open Houses are opportunities for you, the Parent, to witness the tremendous learning that happens in our classrooms! For Parents’ convenience, Open Houses for each classroom are in the morning from 8:30-9:30am. Upon arrival to school, drop off your child in his/her classroom, then head for Room 7 to meet with Ms. Katie for an overview. From there, you will proceed into the classroom for a “Silent Journey” of our work period. 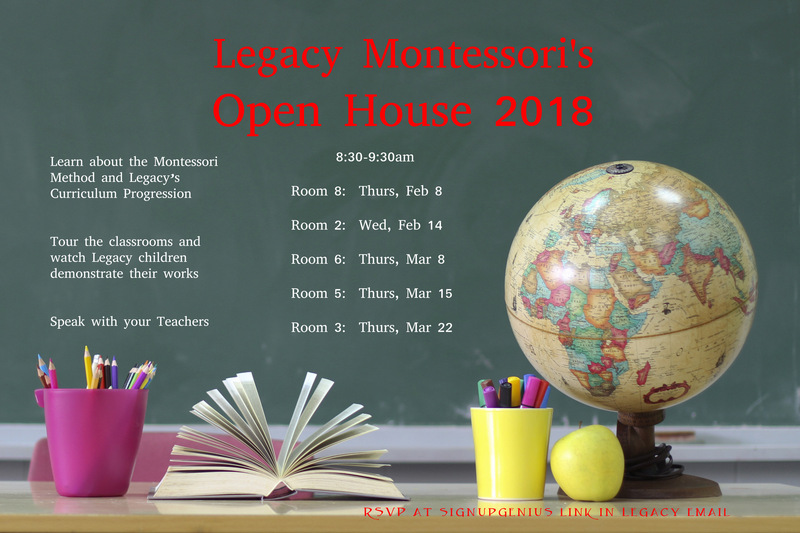 You will walk away with renewed confidence in your child, your Teacher, and in Legacy Montessori School. Copyright © 2011-2018 Legacy Montessori School. All rights reserved.